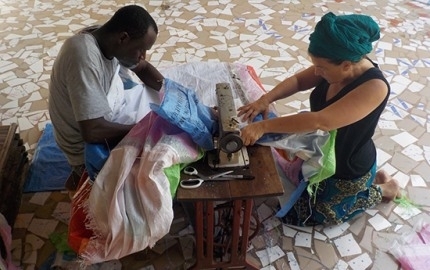 This last Fall-Winter visual artist Dana Lynn Louis spent 9½ weeks traveling to Senegal for Thread, an artist residency sponsored by the Joseph and Anni Albers Foundation. The Alberses—artists from the famed Bauhaus school and refugees from Nazi Germany—spent a lifetime revealing the wonders of color, textiles, and artistic process so that they could be enjoyed across the planet. The Albers Foundation established Le Korsa in 2005 to provide medical care, education, nutrition, and cultural enrichment in some of the poorest and most isolated regions of the world. Louis' sojourn also included a site visit to the Cultural Center Ko-Falen in Mali, West Africa. Join us as she discusses the intense immersion, the exchange of traditions and worldviews, and the lessons taught and learned—including the introduction of yoga to the remote village of Sinthian in Senegal and local women learning drawing and painting (creating potential new village income streams.) Through a rich, visual, multimedia travelogue, Louis invites audiences to consider, how despite cultural polarities, it remains possible to experience the gifts of shared joy and wonder and how we might guide our lives and work toward wellness, connectivity, and interdependence.